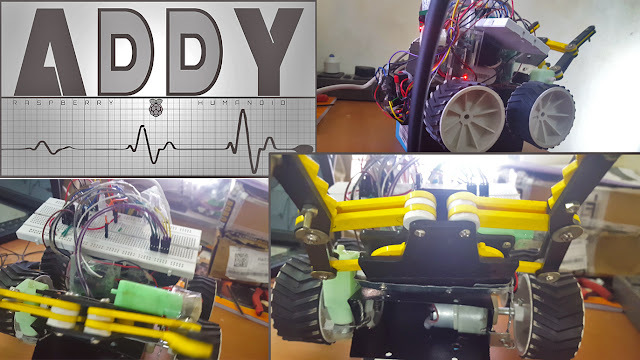 I started my robotics project with its name ADDY it’s a hybrid robot, combination of autonomous and humanoid features. • Control ADDY using any language: C/C++, JAVA, Python. • Track and locate places using its camera which can be rotated 1800 degrees. • Connect to any device with internet connectivity for remote control. • Webserver & Website on localhost/live to control ADDY( www.vslcreations.in). I started working on ADDY for my summer internships at OTS Science Center. Now! I made its ver.2 for the block warrior competition. I have used python to control all motors and its vocal interface. XRDP to remote control using Ethernet cable. soon i will update more details! !